If you’re thinking about learning to code, but you’re not quite ready to pull the trigger, you’re probably devoting a significant amount of time to thinking about the future. There are so many career paths that you could go down, that it is often difficult to make a decision. When considering career paths, it can help to think about where each path may lead in the future. For example, if you think about the future of the mail-carrier, the photographic film developer, or the telephone operator, you may realize that investing your time in learning these professions might not be the best idea. It’s common knowledge nowadays that learning to code is the way of the future. But there are so many different career paths within the overarching sphere of “coding”. Not all code-oriented careers are created equal; some may be dying out while others are just starting to hit their stride. So what, in particular, is the job outlook for web developers in 2017 (and beyond)? 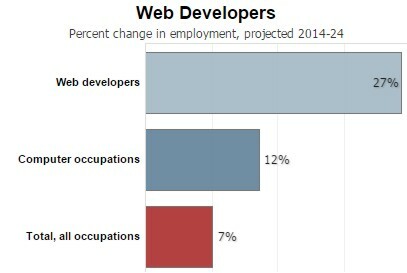 Projected job growth for web developers from 2014 through 2024 is 27% (Bureau of Labor Statistics). That is nearly 4x the national average (7%) and more than twice the “computer occupations” average (12%). Code.org projects that there will be over a million unfilled computer-related jobs by 2020. The gap between supply and demand is growing in computer-related professions, especially when it comes to web development. Every company in the world right now, from mom-and-pop shops to multi-national corporations, needs a website to continue to grow and thrive into the future. Someone needs to build all those websites. Not only that; huge numbers of web developers will need to maintain them on an ongoing basis. So what’s the job outlook for web developers in 2017? It certainly appears that web development will live to see another year. Very likely, the field of web development will continue to grow and grow, for at least another decade to come. Anyone looking to get into a new career would be well-advised to go into web development. Why Is Cyber Security Important in the 21 Century? March 25th, 2019 | Comments Off on Why Is Cyber Security Important in the 21 Century? Web Developer Coding Bootcamp or Self-Study Online Courses? March 11th, 2019 | Comments Off on Web Developer Coding Bootcamp or Self-Study Online Courses?